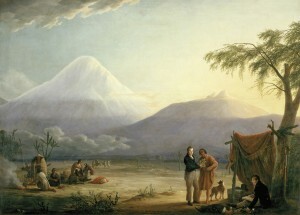 Alexander von Humboldt stands before Chimborazo, which he and Aimé Bonpland, seated, climbed in 1802–higher than any human for decades, and they didn’t use special gear. Painting by Friedrich Georg Weitsch 1806. September 8, 2017. It’s amazing to me how much of the world hinges on the workings of tiny things. 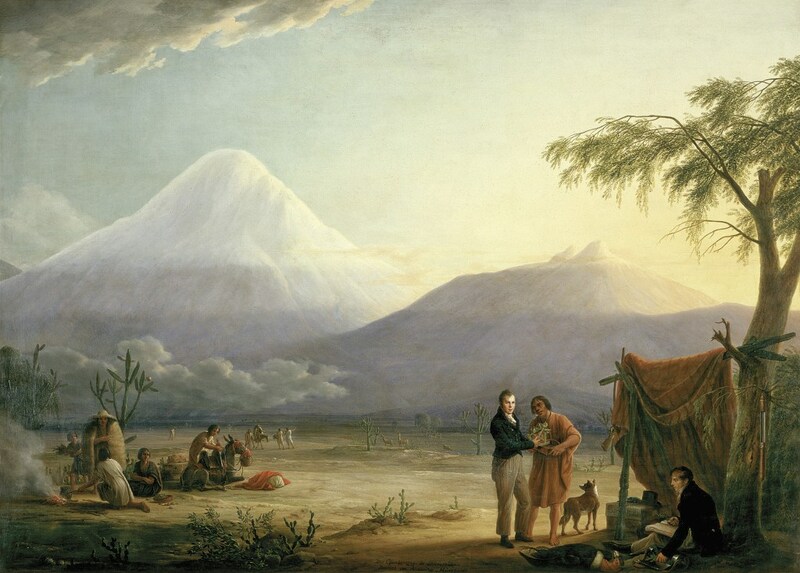 I’m reading about Alexander von Humboldt, the most famous man you’ve never heard of, who paid attention to those small things. It’s not a stretch to say that Humboldt created or influenced most of the technical or scientifically rigorous disciplines of the modern age. He was most active and influential in the first half of the 1800s. He was a friend and correspondent of Thomas Jefferson, and a consultant to his and subsequent administrations. For decades he was among all Earth’s inhabitants the one who’d been highest up a mountain, the volcanic Chimborazo in the Ecuadorian Andes. (Although shorter than Everest measured from sea level, Chimborazo is actually higher into space due to the equatorial bulge in the Earth.) He didn’t invent, but laid the foundations for my discipline, ecology, which emerged as a coherent field around 1900. Add to that sociology, anthropology, meteorology, advances in geology, and several other lines of inquiry in the sciences and humanities. He’s the most eponymously decorated person on the planet, with more places and things named for him than anybody alive or dead: rivers, mountains, counties, colleges and high schools, various species, and, of course, the Humboldt Current. In the mid-1800s he was an intellectual giant, and everybody knew who he was. Back to tiny things running the world, Humboldt was a vigorous collector of data, not just species as he traversed the planet, but of atmospheric, geologic, chemical, and other data. He formalized the art of combining all those data into a story of place, and that story entirely depended on vast amounts of data—big data, you might call it today. 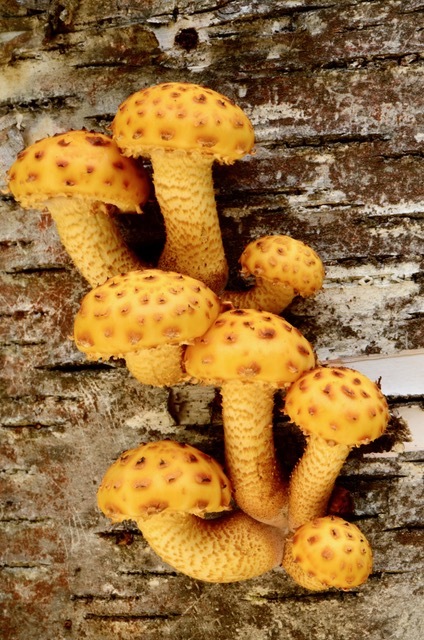 It was the little things that Humboldt noticed and recorded, from flowers and trees to insects and rock types, to the minute pressure changes as he ascended mountains. There’s a famous quote by J.B.S. Haldane who was asked what he could conclude from his biological studies about the nature of the divinity. 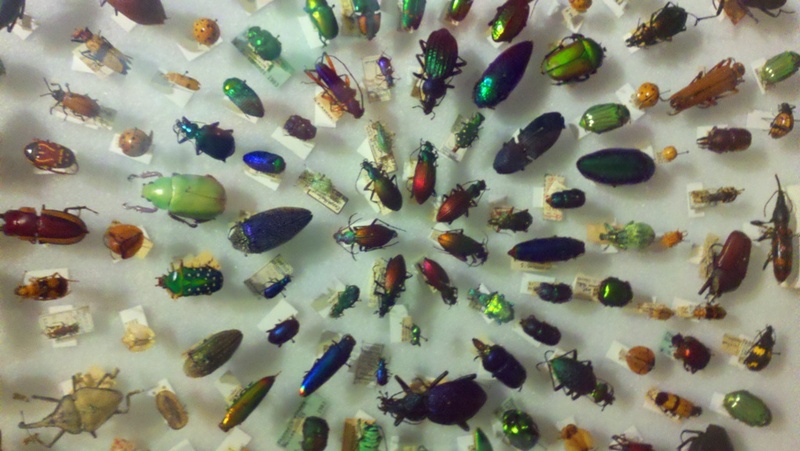 He answered, “God has an inordinate fondness for beetles”—because twenty-five percent of all species on Earth are beetles. Recently we’ve learned how important bacteria are to our survival—not in a negative way, but as part of our body’s architecture, comprising half the cells in our body, with a dramatic influence on our health, depending on which species dominate our gut fauna. Natural history as it relates to everything—culture, economics, quality of life, happiness, soulfulness—this “integral ecology” as Pope Francis calls it—Humboldt envisioned as the Cosmos, a word he reached back to ancient Greek for, in order to frame up the proper relationship among humanity, all the fields of study, and the seen and unseen physical world. I learned recently that Thoreau and Whitman picked up on Humboldt’s theme and worked it out in their own American writings—trying to make of their own lives and thoughts an integral ecology. By contrast, it is so easy to be swallowed up by the minutiae of our created world—from baseball statistics to hair care products, varieties of snack bars on grocery shelves, to makes of cars, the glitterati on screens, fashion in magazines—that we cannot see outside the opaque bubble we’ve created and notice all the small things supporting us, not just our gut bacteria, but the fungi and microorganisms that perfect the soil’s innate fertility and support 200 bushels an acre corn, and the plants which go about their lives and incidentally produce the oxygen that we breathe in order to live. To the stream of this meandering essay, I offer a book title by the renowned ant biologist E.O. Wilson, The Little Things That Run The World. Along these lines, I’m thinking about Jim’s essay on riffle beetles and the centuries of species collections housed in natural history museums around the world. Collections used to be central to biology, but now it’s all about genomics, molecular biology, and CRSPR gene splicing—a technology people can invent new organisms with. That’s where the money is, and that’s what biologists now train themselves to do. But Jim’s discursive on the art of field collections exhibited at the Field Museum of Natural History cracked the door of a little used closet at the back of biology’s big warehouse. Jim wrote about riffle beetles, bugs that spend most of their lives under water, except for a brief fling in the atmosphere after they emerge from their pupal cases. I told him that riffle beetles are one of the key indicators of whether a stream is polluted or not. You can go anywhere in the world, and if you find a riffle beetle, odds are that stream’s watershed is mostly forested or grassy, chock full of wetlands, with nobody piping in factory waste or sewer water. 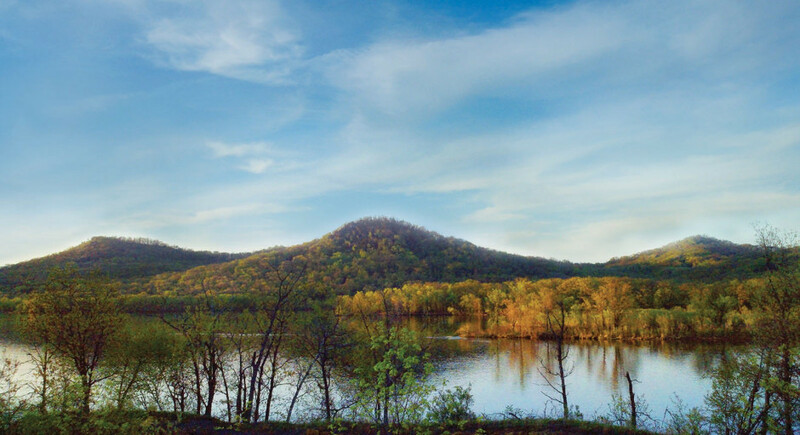 In short, a healthy, resilient place…”alive with the grace of all that in the mind is fleckless, free, and naturally to be desired,” in the words of William Carlos Williams. We’re talking Index of Biotic Integrity! Dozens of scientists around the world have labored over thirty years to perfect this measuring stick that gauges the health of streams. The EPA and state agencies charged with enforcing the 1972 Clean Water Act (which Republicans and Democrats jointly passed –how times have changed! 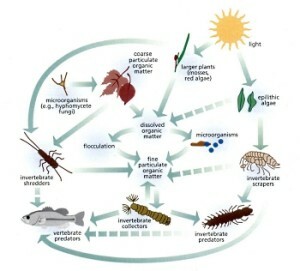 )—they use the Index of Biotic Integrity to identify problems in our nation’s streams and rivers. That whole evaluation system depends on little creatures like riffle beetles, on aerial acrobats like dragonflies and damselflies, and on the unreal swarming of mayflies which are food for trout and the model for a famous lure, the Adams, which is revered by fly fishermen for its ability to snag a fish. Even the not-so-nice black flies—Simuliidae is their family name—are so necessary to a healthy stream ecosystem, and a food chain staple that brings us those trout. Where the little things that run stream ecosystems on Earth fit into the picture. the fish are just one small part, though a tasty one. Image by US Environmental Protection Agency. All these species and more, invisible to us, as if locked away in a cast iron safe whose key was lost a century ago. The human world operates as if such things don’t exist, and yet if they did not, our lives would be the poorer for it—not just emotionally or spiritually, but rather, in the added expense to keep our cultural-economic-techo bubble intact. We’d need to spend more to substitute for the lost services that healthy ecosystems provide, like the water cleansing function of watersheds, as measured with tools like the Index of Biotic Integrity.